…que há dias assim!! 17 guerreiras no tapete, dos 10 aos 47, de 3 países diferentes mas a provarem que o jiu-jitsu é uma linguagem universal e que como disseram “…não é um desporto, é uma doença! !”…UM MUITO MUITO OBRIGADO A TODAS!! 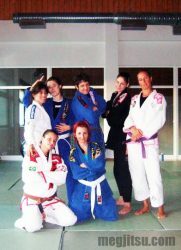 Kátia is a dedicated exponent of women in Brazilian Jiu Jitsu and not only did she organise the Portuguese Women’s Open Mat, she extended her trip to London for the 2010 SENI competition in order to attend our Q2 Open Mat at Dartford BJJ and, for the second year running, will be putting together a women’s only ‘super seminar’ for the Monday after the 2011 European Championships in Lisbon, so watch this space! A second Portuguese open mat is slated for December and Kátia hopes to make these a regular occurrence; a weekend break to southern climes for BJJ and good company can be a great salve to British winter blues.